Preheat the oven to 375°F. Use 1 tablespoon of the butter to grease two 8-ounce ramekins. Coat the ramekins with cocoa powder, tapping out the excess. In a large microwave-safe bowl, microwave the chocolate and remaining 2 tablespoons of butter in 30-second bursts, stirring between each burst, until melted and smooth. Stir in vanilla and egg yolks, one at a time. In a clean bowl, use an electric mixer to beat the egg whites, sugar, salt, and cream of tartar just until stiff peaks form. Gently fold the egg white mixture into the chocolate. Spoon into the prepared ramekins. Soufflés can be covered in plastic wrap and refrigerated at this point for up to 1 day. Bake until puffed and set, about 20 minutes (about 25 minutes if baking directly from the refrigerator). While the souffles are baking, purée the raspberries and sugar in the bowl of a food processor, blender, or with an immersion blender, until smooth. Press the mixture through a fine mesh strainer to remove the seeds. 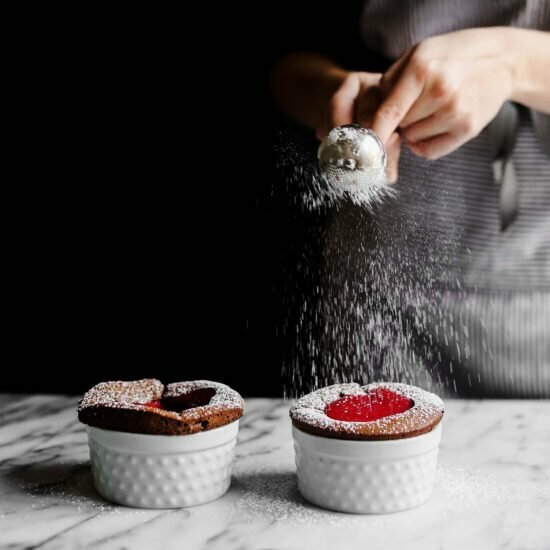 Garnish the chocolate souffles with powdered sugar and serve immediately with raspberry sauce.